CHICAGO — La Bayadère premiered in St. Petersburg in 1877, and is lumped together in that one question about naming all the classical ballets on every college dance history exam. Bayadère was a pioneer in the ballet world at that time — one of the first of many to include a “white act” — but we didn’t see it in the Western hemisphere until 1961. Though it’s grown in popularity since then, American audiences typically encounter excerpts, particularly from the breathtaking “Kingdom of the Shades” scene (or rather, it’s breathtaking when executed well). What an interesting choice for The Joffrey Ballet to mount Stanton Welch’s version of the full-length ballet just three weeks after sharing their exciting Russian Masters program. This is Ballet, with a capital B, which isn’t the typical m.o. for Joffrey, but they pulled out all the stops to bring this seldom seen ballet back to life. In Stanton Welch’s tribute to the original Petipa choreography, all the best bits are still in, but the music and plot have adjusted to better suit today’s attention span. This iteration of the ballet is not wanting for detail, and the transformational sets and costumes from Peter Farmer, special effects and lighting, and even the addition of live snakes pitch in for the upgraded Bayadère 2.0. Trimmed to an easy three acts in two hours or less, the plot goes at such a torrid pace that it’s sometimes hard to keep up. It was really interesting to not quite be able to tell which dancer was who, with the exception of Victoria Jaiani as the lead role, Nikiya, and Amazonian and temporarily bald Fabrice Calmels as the High Brahmin. The men’s roles are expanded from the original to include more actual dancing, including a very impressive quartet in the second act, and tour de force solos from John Mark Giragosian and Rory Hohenstein as Agni and Garuda respectfully (not to mention added difficulty from the masks and full body paint they are wearing). 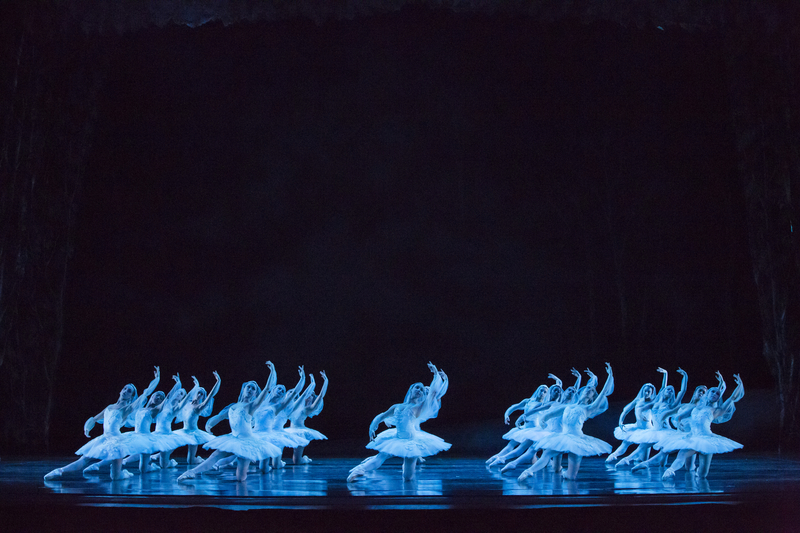 In the end, La Bayadère is all about the girls, and particularly the iconic (and untouched) “Kingdom of the Shades” scene. The brisk pace of the rest of the ballet ultimately caused the original choreography in this scene to feel a little draggy, but it’s hard to describe what it feels like to sit and watch ballerina after ballerina enter down the ramp, just as they did 136 years ago. Step arabesque, temps lié back… it’s a passage that courses through the veins of every ballet dancer, in addition to all the variations that follow. Every single bobble, every wiggly ankle… there’s absolutely nowhere to hide in this scene. When done the right way, the “Kingdom of the Shades” is much more than an exercise in specificity. It’s simplicity is its strength, and, for the most part, Joffrey pulled it off. I give this Shades a B+, but the ballet as a whole package was an A+ that brought the audience excitedly to its feet (including this girl). The Joffrey Ballet presents La Bayadère: The Temple Dancer, through October 27 at the Auditorium Theatre of Roosevelt University (50 E. Congress Pkwy). Tickets range from $31 to $152 and are available at Joffrey Tower (10 E. Randolph Street), the Auditorium Theatre Box Office, all Ticketmaster Ticket Centers, by telephone at (800) 982-2787, or online at www.ticketmaster.com.